not every instruction is encoded this way, more about them might be added later. Nice! I'm happy to see that my streams inspire others to make some new material. I was myself considering making some infographics clarifying things I mentioned about REX/VEX/EVEX (I feel I have not explained them well enough), but you may actually beat me to it! yes, but its complex topic nonetheless. however Eb or Ev followed by Ib or Iz means the ModR/M Byte is treated differently. Reg 111 is not a register, its treated as an instruction. if there is enough time (tonight) i will upload another screen-shot about Jcc. It explains the 4-bit condition encoding on hardware level, great stuff. 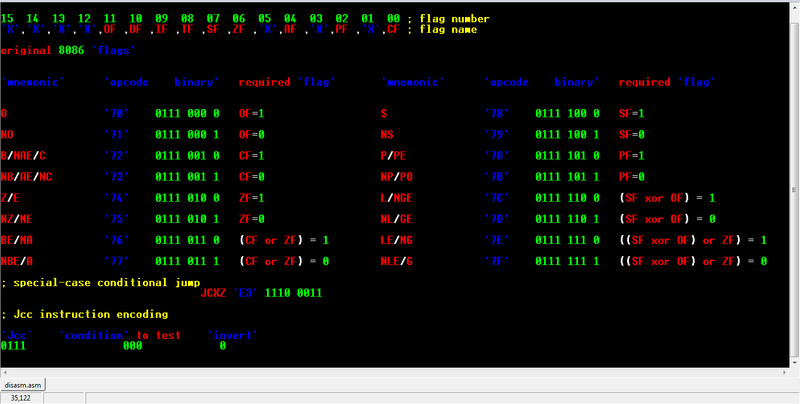 great info, but i included the original 8086 flags. attachment removed, and re uploaded. previous Jcc and Flags attachment had a small issue, and its corrected in this attachment. please notice the required flags, math and final value. If we approach the conditional jump commands from the position machine coding of commands, the four high bits of the command (for the i8086 microprocessor) contain code 7, and the four low bits of the command indicate the condition of the operation. The condition is specified in bits 1-3, and setting bit 0 causes its inversion. P.S. Tomasz Grysztar, pleeeeez, add to the forum engine the ability to build tables - otherwise it is some kind of onanism. JCXZ / LOOPZ / LOOPNZ fall into the [i]special-case conditional jump[i/] due to their relation in binary encoding, i should have had added them (LOOP?) earlier to the infograph. however, CMOV? instruction were not part of original 8086 instruction set architecture, they were added in 80386. The SETcc are the ones added by 80386. CMOVcc were added later, in P6 architecture. Hi, Ali.A and Tomasz Grysztar! Bit С in this case determines the number of shifts, if C=0 - the number of shifts is set directly in the command. If C=1 the number of shifts is either 1 or specified by the CL register. Bit W determines the size of the operand - byte or word / double word. 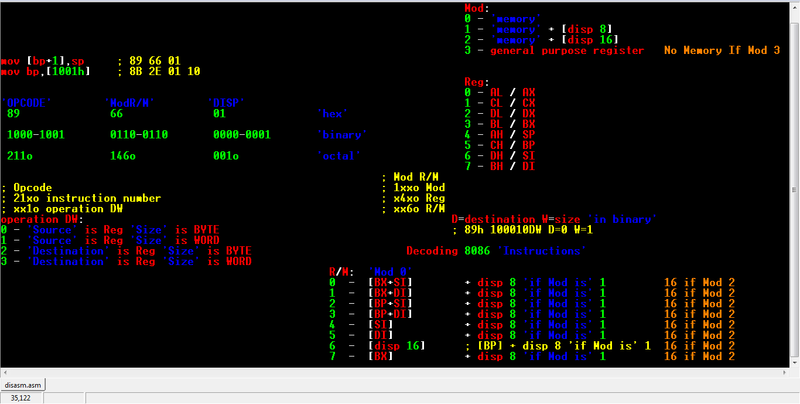 Usually, using the “SAL” command, the translator generates the SHL command code, although there is a SAL-D0Fx command code that is not always recognized by disassemblers, but is executed by a microprocessor. You can find this discussed by me in a few places, like here. This code remains undocumented, but has always been working correctly anyway. This code remains undocumented, but has always been working correctly anyway. ... but might stop working in future CPUs. Such is the problem with relying on undocumented behaviour. intel mention that SAL and SHL have the same opcode, but in fact the REG field of ModR/M byte for SAL is 110 while SHL is 100.